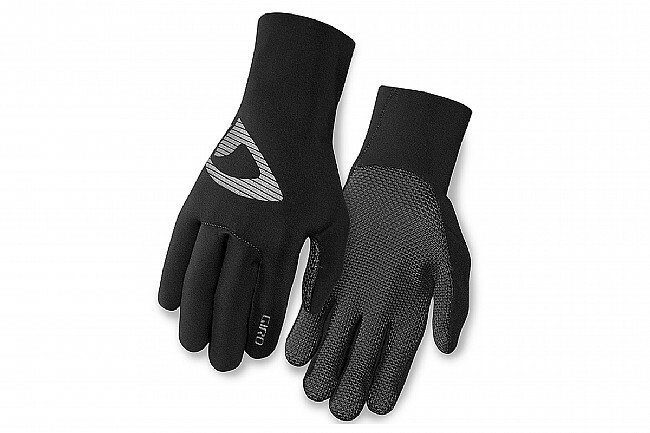 The Neo Blaze is Giro's premium glove for cold and wet weather when maximum dexterity is needed. Featuring premium neoprene, the Neo Blaze holds warmth in the harshest conditions without compromising dexterity or control. Blind stitched and glued seams keep the weather out and heat in. Silicone detailing on the palm offers ample grip and bar feel, while reflective elements improve visibility in low-light conditions. Premium 1.5mm neoprene for optimal protection and comfort. Blind stitched and glued waterproof seams. Reflective detailing for improved low-light visibility. Silicone detailing on palm for improved grip and bar feel. Length 0"-6.8" 6.8"-7" 7"-7.4" 7.4"-7.8" 7.8"-8.3" 8.3"-0"
Palm Circumference 0"-7" 7"-8" 8"-9" 9"-9¾" 9¾"-10½" 10½"-0"
These are sleek, and exceptionally grippy gloves. Riding in the Bay Area they provide comfort on 40 degree mornings so they suit my purpose. However, there are a few caveats. Temperatures much below 40 you'll find yourself wanting more. These are water resistant but not waterproof, as I learned taking them through a New York rainstorm. Most disappointing is that the gloves can't be used with a touchscreen, so forget about using these with Maps or Strava. Still, if you're going for comfort these are a win.